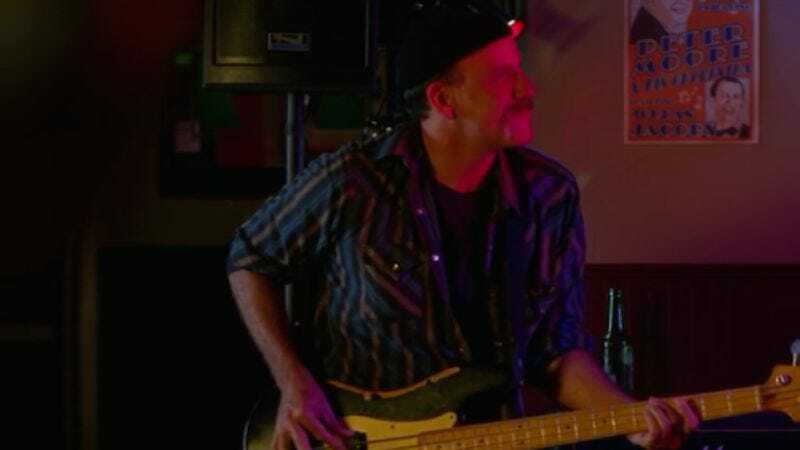 If you’ve reached the fifth episode of Orange Is The New Black’s second season—or haven’t, but are going to keep reading anyway, because this is seriously inconsequential stuff—then you’ve encountered Sideboob, the rock band featuring assistant to the warden Joe Caputo on bass and ridiculous hat. And now you don’t have to sit in an upstate New York sports bar and try desperately to befriend them: Sideboob has an actual EP you can listen to and download over at Bandcamp, where you’ll also find a completely fictional biography that, nevertheless, reads very convincingly like the bio of any number of terrible local bands. “SIDEBOOB takes its influences from a wide variety of sources ranging from classic rock to arena rock,” it says. “The band’s name originates from that time Gabe wore a tank top to the neighborhood pool and his wife wouldn’t stop commenting on how much SIDEBOOB he was showing.” Really, this is missing only a “RIYL: The Beatles, Led Zep, Cream, Marley, U2, Radiohead, GOOD MUSIC” to be totally believable. In reality, Sideboob is the creation of the show’s writers, who penned its songs in collaboration with Adopted Highways, a band of indie-rock veterans that specializes in making music for TV shows and movies. And those musicians can now add a deliberately terrible song about vasectomies to their résumé.